It is common for tenant or landlord laws to differ between all of the various states. For those who rent regularly it’s important to be knowledgeable about all of the rules and laws that govern a particular area. Louisiana is no different. It is important for those who live in Louisiana or move to Louisiana to become properly educated on the Louisiana landlord tenant laws. This is only to be a set of guidelines and not actual rules or laws to govern by. Each reader is responsible for his or her own research and should not use this as a means to make lawful claims. Stay up to date on Louisiana Landlord Tenant Laws + Save money on tenant screening and other property management needs. Join AAOA today, it’s FREE! All tenants must pay their rent as it is stated in the rental agreement at the beginning of the tenancy. This includes paying the right amount on time every time it comes due (be it weekly, monthly or yearly). The rent unit should be left in the same condition it was found—aside from the normal wear of living, there should be no alterations to the condition of the house. This can include painting, floor changing etc. If appliances are given, they must also stay in the unit as well. Tenants may be allowed to alter the premises if it is otherwise agreed upon by the landlord as well. It is important to use the property as it is intended. Any other use may be a violation and can cause eviction. Tenants must allow their landlords to have access to the apartment to fix issues that are of an immediate danger to the tenant. Tenants are liable for any damages they create or that their family or visitors create. Other accidental issues should be reported to the landlord immediately for repair. Tenants must follow all procedures as stated in the lease or rental agreement. Landlords are responsible for giving the tenant the promised property on time and in good, working and safe condition. The property should be maintained in a condition that suits the tenant and should be kept safe. Any damages that provide a danger to the tenant and their family should be attended to immediately. Landlords are also responsible for keeping a tenant’s peaceful petition which allows them to remain private and for the landlord to not intrude without the permission of the tenant. The landlord must also not make alterations to the rental agreement without properly notifying the tenant. Landlords are responsible for paying all taxes or other charges that are made to the property outside of regular rent. If the rental units change ownership during a tenant’s lease, the new owner may change the rental agreement or evict the tenant. There are two types of leases, written and oral with written being the most binding and common. Oral leases can take place but they are impossible to prove if a dispute arises. It is important to always get a written lease to help prevent any issues from arising. There are a few different ways that leases are governed. One way is a fixed-term lease. This can be any time amount that is designated by the landlord and agreed upon by the tenant. It is usually around a year but cannot exceed ninety-nine years. The most common type of lease is a month to month lease. If it is not previously determined, it should be understood that the lease is by month. Some leases contain an automatic renewal clause that will cause the lease to be renewed until the tenant stops it. Others have to be personally renewed and may cause the tenant to have to move without a renewal. It is important to talk to the landlord about this and know what type of renewal the lease has. Roommates can cosign a lease together which makes them both dually responsible for the rent and fees. If a rent payment is late or doesn’t come, landlords reserve the right to charge a fee. These policies should be stated in the rental agreement. The death of the tenant or landlord does not nullify the obligations of the lease. The designated heirs to both parties will legally carry on the obligations and processes. The Federal Fair Housing Act says that landlords may not legally treat their tenants differently, change their rental agreements or reject rental on any discriminatory basis. If tenants feel discriminated against, they can complain to the U.S. Department of Housing and Urban Development. Any other complaints against a landlord can be filed here. Deposits are very common in the realm of renting. There are two different types of deposits to be aware of and various things concerning them both. First, there is just a normal deposit. This is given oftentimes to reserve a space for the tenant. In most cases, if the tenant does not move in by the given time, they may lose this deposit. Another deposit that may come up is a pet deposit. This is used to offset any damages that may be made by a pet living in the unit. It is also returned if there are no damages. The last deposit is a lot more common. It is called a security deposit. Security deposits are oftentimes used to offset the cost of damages that are made by the tenant during their stay or if they fail to pay their last month rent. If the deposit is not enough to cover all of the damages that are made by the tenant, then they are legally responsible for paying the additional charges. If there are no damages or unpaid rent, the tenant should get their security deposit back. Landlords do not have to pay interest on the security deposit unless you both agree upon it at the beginning of the lease. The landlord must provide a list of what was deducted from the deposit if the entire thing is not returned. Worn carpet or wood flooring. Old dull or chipping paint. Leaving a completely trashed or messy unit that has to be cleaned. Leaving trash that has to be thrown away. If the tenant does not give at least a ten-day notice of their moving, then the security deposit can be kept by the landlord to offset their losses while finding a new tenant. If all of the criteria are met, the landlord has one month after the move to return the deposit. It is important for tenants to take the necessary steps to ensure that their security deposit is given back. Landlords can be taken to court over an unpaid or unjust security deposit return. Information Regarding Eviction and Lease Termination Sometimes, tenants have to terminate their lease prematurely or landlords may evict their tenants. Landlords do not have to have a reason to evict a tenant; however there are some legalities that concern eviction. It is vital for tenants to know all of them as a tenant to ensure that no problems arise if the process has to happen. To terminate a lease prematurely, the tenant must do it with at least a ten day notice. If they do not do this, they risk losing their security deposit. Each circumstance is different and should be discussed with the landlord ahead of time. For evictions, the procedure must be followed exactly. The landlord should give a written notice of eviction for the tenant to vacate. The tenant then has 5 business days to vacate the premises. If or when the tenant fails to vacate the property in that amount of time, the court order is given. The tenant will have to appear 3 days after the court serving before a judge and state why they should not have to vacate. If the landlord wins, the tenant then will have given twenty-four hours to vacate the property. If they still do not vacate, a sheriff will physically evict them. A key component of landlord tenant laws is also Louisiana Tenant Screening Background Checks. We’ve dedicated an entire page to it because of its importance. Visit Louisiana Tenant Screening Background Checks to screen your tenant. All states require a variety of forms to rent an apartment to a tenant and Louisiana is no exception. Check out American Apartment Owners Association’s Louisiana Landlord Forms now. 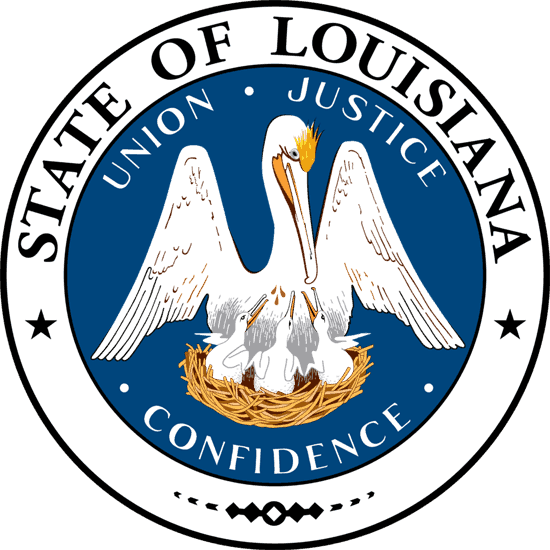 Looking for landlord tenant laws outside of Louisiana? The American Apartment Owners Association offers helpful landlord tenant laws for all 50 states. Click on any of the states listed below and go directly to its landlord tenant law page. To visit the homepage of landlord tenant laws, click here. To access even more information, go to the Louisiana Law Help. To access the Federal Fair Housing Act, visit the HUD U.S. Department of Housing and Urban Development.